Brett Favre has been fined $ 50,000 by NFL for failing to cooperate with an internal investigation.The Minnesota Vikings quarterback was accused of sending sexually explicit messages to New York Jets game-day hostess Jenn Sterger back in 2008 while he was representing for the Jets. 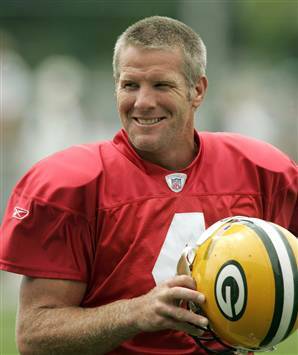 But despite all this the accusations made, NFL has been unable to conclude either Favre send those messages. According to statement by Commisioner NFL Roger Goodell stated: "Could not conclude that Favre violated league policies relating to workplace conduct,"
"The investigation was limited in several respects because the conduct occurred in 2008 but was not brought to our attention until this fall. As a result, certain records and individuals were unavailable to the NFL," the NFL said in a statement. Goodell was also very critical about the discipline as well, as he made very straight forward that if during the investigation Favres is found guilty, a ''substantially'' bigger penalty shall be imposed upon.